Ancestral Voyage was composed, arranged, produced, recorded, and mixed entirely via the internet. In fact, Timothy Martin and Ed Schaum have never even met, they wrote and performed this entire album together, but they were 2,000 miles apart the whole time. Ancestral Voyage marks the return of complex arrangements and majestic sound to mainstream rock music. Dreamship is Timothy Martin, the acclaimed composer, keyboard master, and soaring vocalist; and Ed Schaum, progressive composer and virtuoso guitarist. CD available at CD Baby and most online music stores including Amazon and Tower. 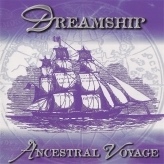 For more information about Dreamship, visit the official Dreamship website.